Before proceeding with my weathering project I wanted to find a matte varnish that would actually lay down an unmistakable matte finish. 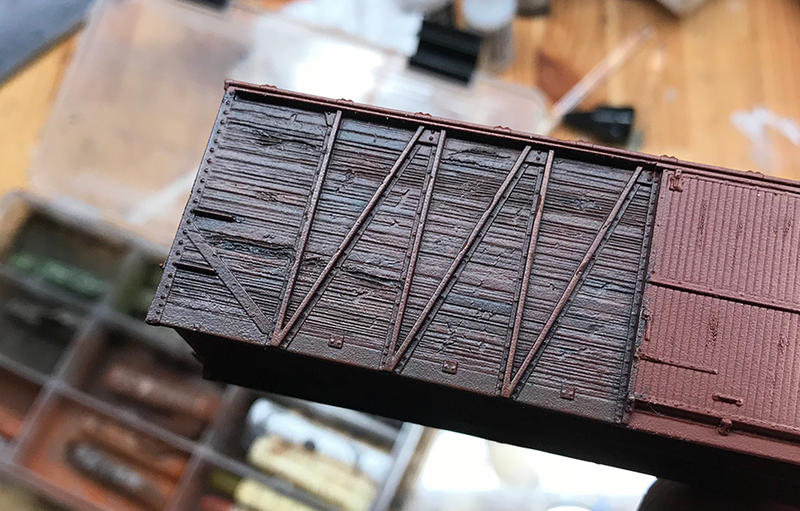 I first noticed the problem of shiny matte when I went to seal my first weathering attempt – the corner of the boxcar. The finish went from very dry matte to an unmistakable sheen – ruining my wonderful work! I decided to find the perfect matte before proceeding. For years I’ve been using trusted favorites such as Testor’s Dullcote but I’ve never been happy with the finish. I generally found the result too shiny – not really matte at all and much more of soft sheen. I believe it really ruins the look of a nicely finished model makes the result look toy-like. I really wanted to find a matte varnish that would do a better job. 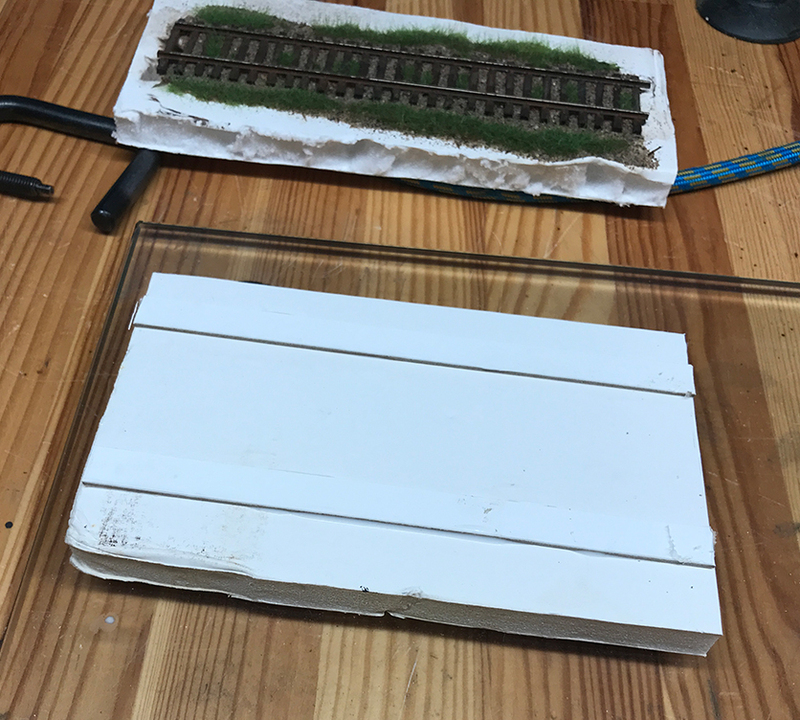 After spraying this with Krylon Matte spray there is an unmistakable sheen on the boxcar which ruins it and makes it very unlifelike. Just getting back to normal after a very unsettled domestic environment that has included trips to Europe, a kitchen remodel (that turned our lives upside down for twelve weeks) and then six weeks of guests and mini-trips away from home. Whew! All over now till the end of December after which I’m off to Europe again. Found in the north-eastern California desert. 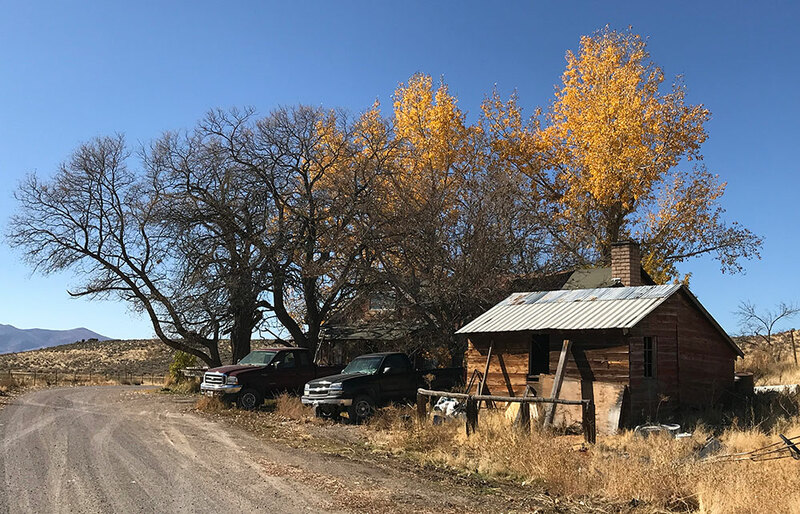 I didn’t get any more pics of this house but will return next year to do so. I’m thinking of building a model of it within a diorama – and of course moving the location to the upper midwest. The SP’s Modoc Line is nearby. First step in this process was to start adding physical changes to the model. This is a very important stage as it represents the first step away from the finish of the original manufactured model and immediately gives the piece its own identity. The marks represent what I have previously called ‘short-term specific weathering events’ and will be treated slightly differently from other areas of the model. The damage may have been sudden or over a time period but whichever way it has led to a unique effect that has occurred faster than the weathering elsewhere. 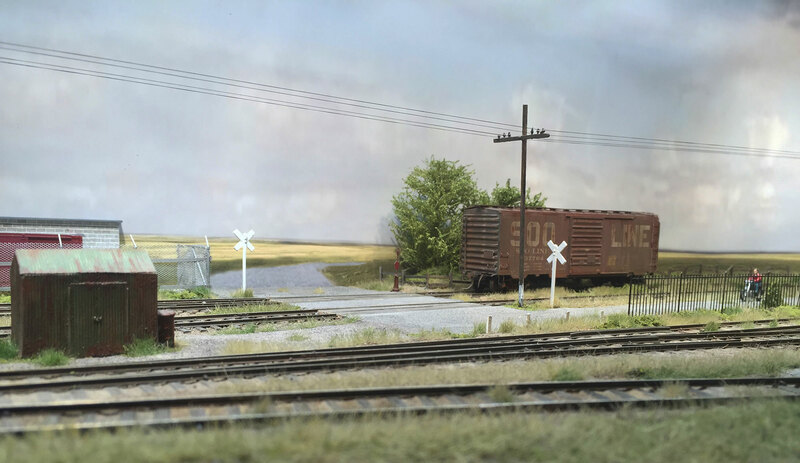 This is an important detail that can be represented on any model from boxcars to oil tankers. Pitted and damaged slats are a particular weathering feature of these single sheath boxcars. Marking each box car differently begins the process of giving each one its own identity.